Such an aphorism isn't always true, but it sometimes is. 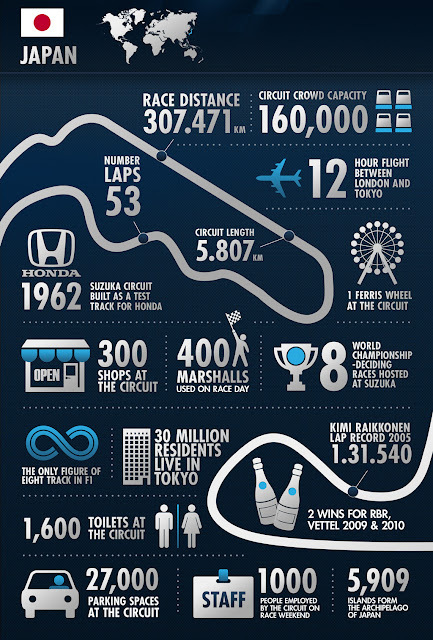 And it seems to especially apply to the F1 circuit. Of course, some of the new-fangled Tilke-dromes are better than others, but none has got even close to creating the quickening of the pulse that F1 drivers and aficionados experience when cars circulate Suzuka. Why is this? Mainly it's that the layout is dominated by rapid, challenging turns, the sort that separate the great from the good, the sort that would most likely be laughed out of court were it proposed these days. Combine this with the track's uncanny knack of being the stage of drama and acrimony, as well as with the large and enthusiastic Japanese support looking on, and you have a near-perfect mix. Indeed, such is Suzuka's classic nature it feels rather like Messrs Nuvolari, Fangio and Clark should have pounded around the track in their heydays; that F1's first visit here was as late as 1987 seems rather incongruous. You've either got soul or you ain't. Suzuka has it. So, all feels good with the world as we approach the Suzuka meeting this weekend. And even over and above that it's Suzuka, there are plenty of reasons to think that the on-track action will be close and unpredictable. There are a good few teams entering the weekend with reasons for optimism. McLaren has of course been the team to beat in recent weeks, and but for a disintegrating gearbox in Singapore would likely be boasting four wins on the bounce right now. On balance, the MP4-27's been the best handling car of the season, especially through quick turns, so it should be perfectly poised for the Suzuka challenge. Jenson Button faces a five-place grid drop for a gearbox change, a particular impediment around this track (the one drawback of Suzuka is that it isn't the easiest to overtake on), but then there is his team mate. While there will be no doubt much speculation about how things will go now that Lewis Hamilton has handed his McLaren notice in, I'd be astonished if it has a negative impact on Lewis's driving, as he's driven beautifully all year even when talk of his future spun like a whirlwind around him, or indeed on how McLaren treats him. This weekend is surely, to a large extent, a matter of who can get ahead of Lewis. In years gone by while approaching a Suzuka meeting many eyes would have turned to the Red Bull. It may well be strong, and indeed Sebastian Vettel qualified on pole in each of the last three visits to Suzuka and won two of them. But somehow in 2012 things don't seem quite as clean cut as before. 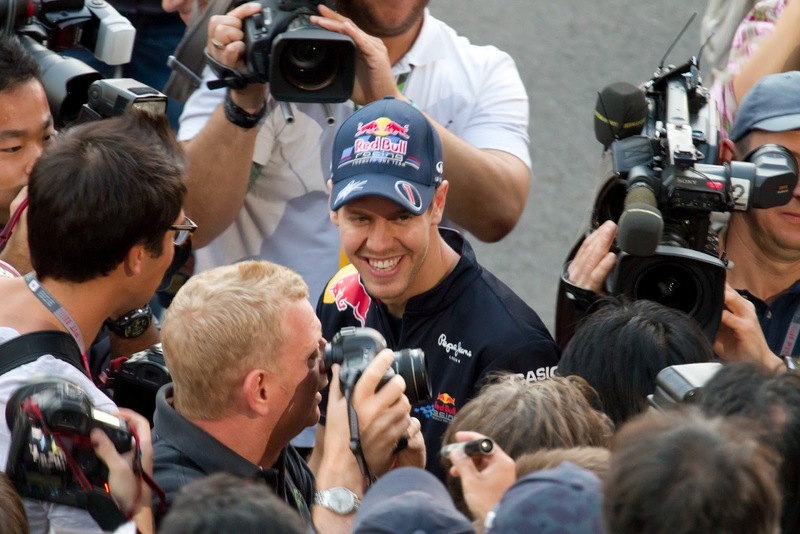 Will Sebastian Vettel be all smiles this weekend? The Red Bull is still a handy enough machine, handy enough to keep Seb just about within striking distance of Fernando Alonso at the drivers' table top via some tenacious drives. Yet it's only been at street tracks generally that the Bull has threatened to run away in 2012. It was at one such street track last time out that the Bull under Seb's command bounced back from two weekends (admittedly on low downforce tracks) where it wasn't quite at the front-running pace. It'll be fascinating to see where the car ends up this time in the pecking order, on a track that's neither low downforce nor on the streets. And it may give further clues about whether Seb can really enact a title charge. Of course, Ferrari and Fernando Alonso will be more determined than most that they don't enact one. Ferrari struggled in Singapore, but I can't help but think that the reports of the death of the Scuderia are greatly exaggerated. The Singapore struggle may well have been circuit specific, in that the car's weak spot is slow corner understeer (also seen in Hungary), along with traction out of slower corners, neither of which will be nearly as much of a problem around Suzuka. And last year Alonso followed up a rearguard action at Singapore with damn near winning at Suzuka. If nothing else, we know that Alonso as usual will give himself the best possible chance of a strong result. And, as has often been the case this year, this weekend there may well be ample interlopers at the sharp end from outside of the usual suspects. First off is Lotus, who've tended to be right on the button on flowing tracks such as Suzuka, and the E20's gentle touch on its tyres will be a handy asset given Suzuka's long quick corners should take plenty out of them (though the soft and hard compound combination will cause much head-scratching and not just at Lotus). Additionally this, plus the long lap, should mean Lotus doesn't have its usual tyre warm up impediment for a quali lap. The track also is be right up Kimi's street (his drive there in 2005 is one that I'll take to my grave with me). But then again we've been optimistic plenty of times before this year about Lotus only for hopes to be dashed somewhat. And this weekend we may well also see what you'd be forgiven for doubting you'd live to see, the qualifying/race debut of Lotus's famous rear wing 'device'. As explained on this blog before, its lengthy gestation period combined with the cool reaction of other teams suggests to me that the 'device' isn't all that. But Suzuka should provide more clues either way. 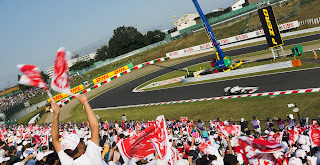 How will Kamui Kobayashi do in front of his home support? Sauber should be in good shape for similar reasons to Lotus, namely liking fast flowing tracks and that its gentle tyre handling will serve it well. The team also brings a technical upgrade with it, which it's apparently confident in, and what about Kamui Kobayashi on home soil? He qualified up in seventh place here last year before a poor start ruined his Sunday. And he really needs a strong run, as by many accounts he's driving for his future right now (as an aside, where his team mate's ended up graphically demonstrates the thin dividing lines between getting the breaks and getting the boot in F1). Then there's Williams, which has been competitive this year at similar tracks such as Spa and Barcelona which test out the aero package. And of course Pastor's been on his best behaviour in the past two races; what odds on another run all the way to the top of the podium? 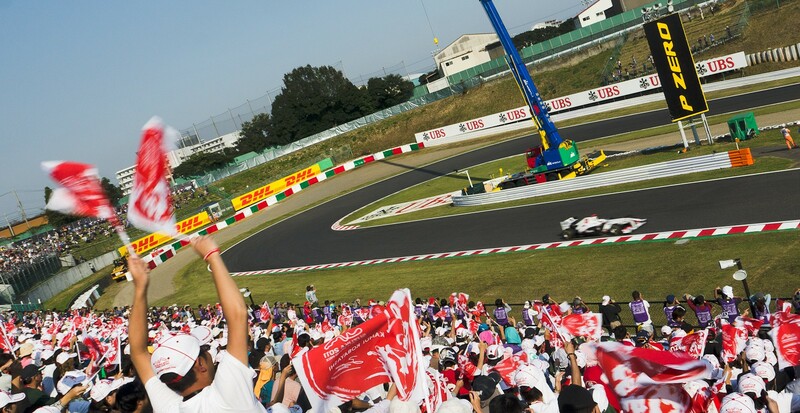 Not for the first time, it'll be difficult to know where to look at Suzuka this weekend. The really rather lovely infographic on the Suzuka circuit shown above is provided by the Red Bull Racing Spy App. For more great infographics, to follow the performance of both Sebastian Vettel and Mark Webber for the rest of the Championship and to keep up to date with all the gossip from inside the paddock, download the FREE app here: http://itunes.apple.com/gb/app/red-bull-racing-spy/id504350767?mt=8 or search for the Red Bull Racing Spy in the app store.